Globalization leads USA universities are accepting more and more foreign students. ACT test is one option for them to apply for admission. For ESL (English as Second Language) students, ACT test is much more difficult than for USA high school students. They will face tougher contents and challenge harder preparation, so they need more resources. Students have many tasks to prepare ACT test. In general, building vocabulary is the top one, because vocabulary is the foundation of all English-related test sections, like reading and writing. 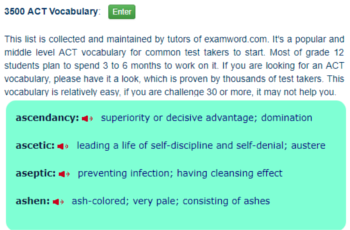 Most of ACT test takers have to spend much time to learn new words and review known words. It isn't an easy job for them. As for ESL students, it becomes much heavier. In addition to normal ACT vocabularies, ESL students have to learn some extra words. Because ESL students live in non-English language circumstances; their English skills completely come from various textbooks. For example, 'basement' is a very common word in America, but foreign students may didn't hear this word yet. If they prepare ACT by normal vocabularies, more or less some common words will be missed. ESL ACT Vocabulary is compiled for non-English speakers to cover the gap. Basically, words in this list aren't very difficult, but they are likely used on ACT test papers and confuse the foreign test takers. These words are usually ignored by mainstream ACT vocabularies because of simple or common. To help ESL students study by mother language, this list includes definitions in 20 languages. Last but not least, ESL students are supposed to choose a common vocabulary, like 3500 ACT Vocabulary, as the base to build own ACT vocabulary. This list, ESL ACT Vocabulary, is only an additional list to fix vocabulary leak of ESL students. Building ACT vocabulary is a tough task, especially for ESL students. Set your goal and choose your way both aren't easy job, you should get authoritative information as more as possible. ACT Official Website is a right place to help you out.